Now that Christmas 2014 is history, the music scene is coming alive again. 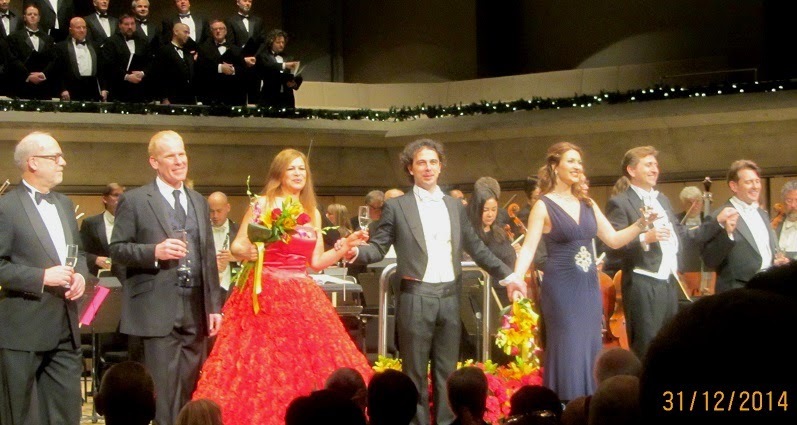 Two of the highlights are the New Year's Eve Opera Gala Bravissimo! and the New Year's Day Salute to Vienna, both presented by Attila Glatz Concert Productions. For opera fans, Bravissimo! is a good opportunity to hear voices that Toronto audiences don't usually get to hear. The soloists this year are Russian soprano Natalia Ushakova, Hungarian mezzo Viktoria Vizin, German tenor Andreas Schager, and Canadian baritone Brett Polegato. Before last evening I was only familiar with Polegato, who has made an enviable career both at home and abroad. I also recalled fondly the voice of mezzo Viktoria Vizin, who was a fine Marchesa Melibea at the COC's Viaggio a Reims a dozen years ago. The other two singers I had not heard live before. Schager is that rare breed, a heldentenor - and a Daniel Barenboim protege - singing the heaviest repertoires of Wagner and Strauss, while Ushakova is a dramatic coloratura who sings a wide-ranging repertoire from the stratospheric Queen of the Night to the spinto soprano role of Amelia in Un ballo in maschera. Incidentally, Schager made international headlines in April 2013 when he stepped in to sing Act One of Siegfried at the Berlin Staatsoper replacing the regularly scheduled Siegfried, Canadian tenor Lance Ryan, who couldn't get from Vienna to Berlin in time for an unusually early curtain of 4 pm! The conductor of Bravissimo was Italian maestro Francesco Lanzillotta. Concluding the first half was three pieces from La boheme. (The fourth piece, the quartet from Act 4 was cut) I must say I was not expecting a heroic tenor to take a stab at Che gelida manina, but Schager not only sang it, he sang it well, and in the original key up to a ringing high C. Ushakova was less successful with Si, mi chiamano Mimi. Her voice is like an inverse pyramid, big up top and almost inaudible in the lowest reaches. There wasn't much mezza voce, and she went sharp several times in the upper middle. Also one would have liked a bit more legato and the use of portamento in Puccini. That said, it was uncommon and undeniably exciting to have two big voices in this music, especially O soave fanciulla at the end. At the beginning of the second half, MC Rick Phillips announced the surprise addition of Canadian tenor Roger Honeywell. He sang the Flower Song from Carmen, originally assigned to Schager, with a nice combination of head voice and ringing forte. Perhaps due to insufficient rehearsal, there seemed to be some disagreement with tempo which appeared to be uncomfortably slow for Honeywell. Later, the tenor joined forces with baritone Brett Polegato in a mellifluously sung Pearl Fishers Duet, which also had a few tentative moments. Polegato did his best singing of the evening in an excellent Toreador's Song, with plenty of swagger and bite. 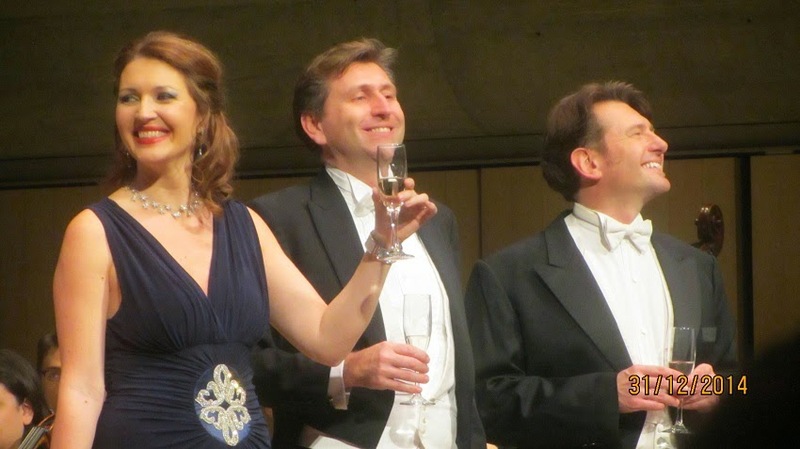 Vizin was also at her best as a vocally and dramatically riveting Carmen. Ushakova sang Violetta's big scena in Act 1 La traviata with great high notes, although one would have liked more chiaroscuro. The formal part of the evening ended with the Triumphal March from Aida with the forty-member chorus doing yeoman service. There were three encores - the aforementioned Pearl Fishers Duet, and the Barcarolle from Tales of Hoffmann with Ushakova (Giulietta) and Vizin (Nicklausse). 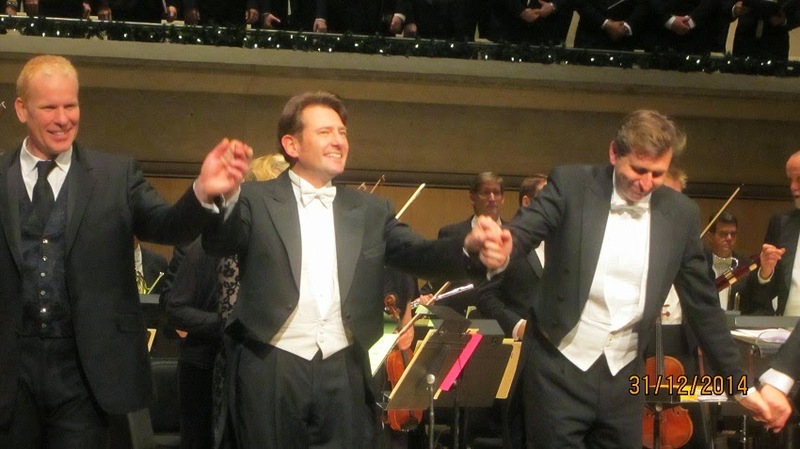 Through it all, conductor Francesco Lanzillotta in his Toronto debut led the pickup orchestra with a firm hand. No New Year's Eve concert was complete without Libiamo, libiamo from La traviata, and of course, a rousing rendition of Auld lang Syne with the audience joining in. Conspirare Celebrates Christmas for Everyone!